Keep a camera handy. The oceanfront water park promises hours of kids yelling, "Watch this!" Sometimes popcorn and a DVD are all the entertainment you need. Sneak in a workout early so you have more time at the pool or beach. You're still close enough to hear the ocean in between kids' cannonballs. Located on the south end of Myrtle Beach. Your kids will love the water park with a 15 foot water slide! Don't let the cold interrupt your swim plans, there's an indoor pool at the resort. Relax with a refreshing cocktail at Malibu Beach Bar or a snack at Oceanfront Snack Bar. 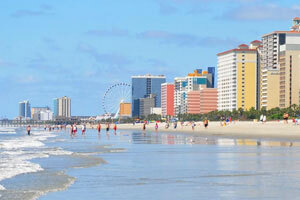 The beachfront Sea Crest Oceanfront Resort is conveniently located near Myrtle Beach’s best attractions. Don’t bother unpacking once you get to your condo, just get changed into swimsuits, apply SPF and head for the nautical-themed on-site water park. It features a submarine, slide, shipwreck and every sprayer and splasher you can imagine. Go for a swim in one of the two pools or float along one of the two lazy rivers. Little ones won’t be able to get enough of the children’s pool. I’ll bet that you’ll start to wonder if they are part fish. Lounge with a refreshing drink from the poolside bar and work on your sun kissed look. Time for lunch? Look no further than the Malibu Beach Bar & Oceanfront Snack Bar. You won’t even have to leave the pool deck to enjoy burgers, hot dogs, seafood, and sandwiches. There’s even a special menu just for kids! Need an afternoon pick-me-up? There’s an on-site coffee shop, Beach Java Cafe, that serves Starbucks. Studio condos sleep two to four guests. Kitchenettes allow you to make the basics. One-bedroom condos sleep four to six guests, and select one-bedroom condos feature jetted tubs. Stop by the on-site convenience store or nearby Food Lion – your full kitchen won’t stock itself. Bring the kids along to make sure that no one’s favorite snacks are forgotten. When you get back to your condo, make a batch of your famous cupcakes (you are on vacation!) while the kids assist with mixing and frosting. Did things get a little wild with the cake batter? No problem! Sea Crest Oceanfront Resort has a laundry facility on-site – score! The resort also has daily housekeeping, so that’s one less thing to do. All condos have Flatscreen TVs with cable channels, perfect for catching a sitcom rerun. Sea Crest Oceanfront Resort is just a short drive to the SkyWheel. It’s almost two-hundred feet tall and features the best views of Myrtle Beach. Surprise the kids with a trip to Family Kingdom Amusement Park. It features over thirty-five thrill, family and kiddie rides including roller coasters, bumper cars & boats and go karts. Shopaholics, rejoice! Broadway at the Beach is just a ten-minute drive from the resort. Treat yourself to a new pair of shades at one of the three Sunglass Hut locations. Make your own unique piece of jewelry at Pick a Pearl and let the kids make their own stuffed animal at Build-a-Bear. Bring home a souvenir for your four-legged family member from Reigning Cats & Dogs. Grab a burger at Hard Rock Cafe, seafood at Joe’s Crab Shack or pizza at Extreme Pizza. Check out the 750,000-gallon shark tank at Ripley’s Aquarium. Go on a glass-bottomed boat ride or have a stingray experience. - Guests that are planning to arrive after midnight must contact the property in advance using the information on the booking confirmation. Kids stay free! Children under 15 years old stay free when using existing bedding. Rollaway/extra beds are available for USD 10.90 per day. This property's required deposit at check-in is payable by credit or debit card. For more details, please contact the office using the information on the reservation confirmation received after booking.